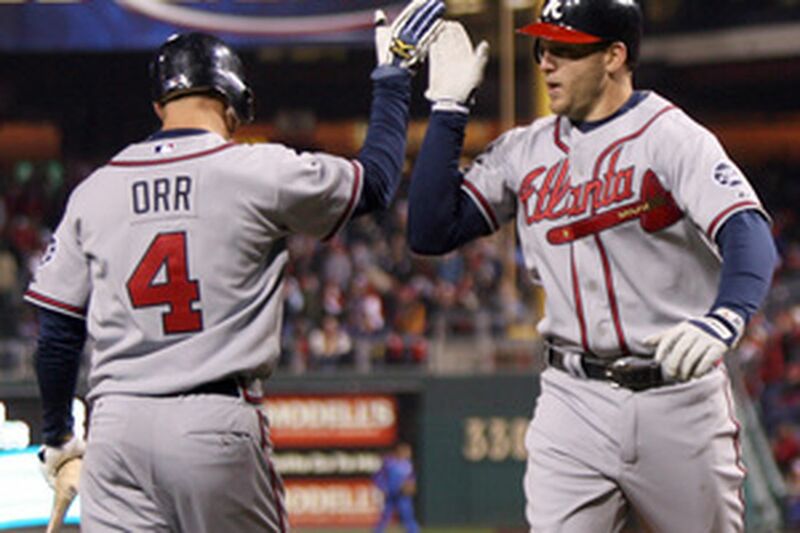 Braves' Scott Thorman is greeted by Pete Orr after hitting a two-run homer in the 11th inning. When the Phillies drafted Adam Eaton in the first round of the 1996 draft, no one ever imagined it would take him 11 years to make his Phillies debut. "Obviously, when you get drafted in the first round, you assume you're going to get to the big leagues with that team. At least I did," said Eaton, who faces Chuck James today when the Phillies host the Atlanta Braves at Citizens Bank Park. After 3 years in the Phillies' minor league system, Eaton was traded to the San Diego Padres for Andy Ashby in 1999, where he spent the next six seasons before being shipped to Texas. In November, the Phillies signed Eaton as a free agent to a 3-year, $24.5 million deal after he went 7-4 with a 5.12 ERA last season with Texas, including 4-0 in his final six starts. While the Phillies acquired him as an added threat in the starting rotation, his spring-training numbers could easily prove to be otherwise. Eaton was 0-3 with a 7.91 ERA. In 19 1/3 innings he allowed 29 hits and gave up 17 runs. However, Eaton doesn't think that will affect him today. "Spring-training numbers are what they are. You can't really change them," Eaton said. "I'm just looking for a good season, whether the numbers are there or not. At the end, you never know, but if the wins and losses are where they are supposed to be, then we should be OK."
The Phillies hope Eaton can stay healthy. Throughout his career, Eaton has been on the disabled list six times and has missed nearly 30 starts in the last two seasons. Manager Charlie Manuel said in the three games he watched Eaton pitch this spring, he thought he had a good fastball and breaking ball. However in the final two games, Manuel said, Eaton seemed to have a tough time with his command. Manuel believes Eaton has what it takes to be a vital part of the Phils' starting rotation, which is why he'll get some leeway despite his tough spring training. "I'll give him plenty of rope. I don't plan on hooking him," Manuel said. "He's one of our starters and I'm going to give him all the chances in the world." That should help Eaton's comfort level, especially given that he is one reason there is so much optimism surrounding this ballclub. "Regardless of what the situation with me coming in is, I have expectations of myself to perform well and at a consistent level," Eaton said. "There are people out there that want me to do well because I was a free agent and making a lot of money, but moreover than that, I want to do well for myself and 24 other guys in this clubhouse." Jon Lieber (right oblique injury) threw in an extended spring game Tuesday in Clearwater, Fla. Pitching coach Rich Dubee said, "He was fine and threw good." Lieber struck out five in three innings. Lieber is scheduled to pitch two innings in an extended game tomorrow. If that goes well, he could return to the Phillies as early as Monday, when the team faces the Mets in New York. However, that doesn't mean Lieber - who won't be stretched past two innings tomorrow - will return to the starting rotation. The Phillies are still awaiting the recovery of Freddy Garcia (strained right biceps). They expect him to return around April 15, which means Zack Segovia would start on Sunday against Florida. The 23-year-old righthander will probably return to the minors once Garcia, who is scheduled to throw 45 pitches in a rehab assignment today in Clearwater, returns to the rotation. Lieber would likely replace rookie reliever Joe Bisenius. "Lieber is a guy who has a quick step and has real good arm speed," Manuel said. "He's a strike thrower. So coming out of the bullpen, you like a guy who can throw strikes." The downside, Manuel noted, is that Lieber has been a starter for most of his 13-year career. "We just have to kind of bring him along," he said. "I think Lieber has the experience to be a good pitcher in the seventh or eighth inning."